The Make-Believe Flight by Jean-Honore Fragonard, Part 6 of the Introduction to Art and Artists of Our Time. From the painting by Jean-Honore Fragonard. JEAN-HONORE FRANGONARD was born at Grasse, in Provence, in 1732. His father was a commission merchant in the town, and at the time his boy was fifteen years old, his small fortune was swallowed up in an unfortunate speculation. Hoping to mend matters, and perhaps to save something from the wreck, he came to Paris with his family and placed his son with a notary. But the usual story repeated itself; the boy had no mind for study, and was forever making sketches upon the margins of his books, and his master finally advised his father to make him an artist. Boucher was naturally the master fixed upon, but Boucher refused him until he should have learned the elements of painting. His mother then took him to Chardin, who gave him a place as painter's-boy, and in the intervals of the usual chores set him at work copying engravings, the only teaching that seems to have been attainable in the studios at that time. The lad was in earnest, however, and for lack of teaching by his master, who for that matter declared to his parents that he was not worth teaching, he used his eyes, studied the pictures in the churches, the only ones accessible - for at that time there were no public galleries - fixed them in his memory, and returning home drew them as best he could. One day, of his own motion, putting some of these sketches in his pocket, he presented himself at the studio of Boucher, and showed him what progress he had made. Boucher, kind-hearted and sagacious, ever ready to encourage youthful talent, received the boy well, and pleased with his work, gave him occupation with his other pupils in the preparation of the pictures he was engaged upon for the Gobelin tapestry-manufacture. At the end of two years Boucher advised him to compete for the Roman Prize, and when Fragonard reminded him that the competition was not open to him, since he had not gone through the Academy, Boucher replied: "You are my pupil, that is sufficient;" and Fragonard was sent to Rome; a fact, says De Goncourt, no doubt unique in the history of the Prix de Rome. Fragonard at first found himself out of his element in Rome. Michaelangelo frightened him, the cold perfection of Raphael discouraged him; he remained for several months in a state of indolence; at last he found in the later Italians something more congenial to his nature, and he gave himself up to the study of Baroccio, Peitro da Cortona, and Tiepolo, at first with pleased surprise, but later with a zeal that showed he had found his world. His indolence vanished like a mist in the sun under the influence of these masters, and he devoted himself entirely to work, drawing incessantly; and falling in company with another young Frenchman, Hubert Robert, he passed from the study of paintings, to the study of the ruins and ancient buildings of Rome, which he and his companion proceeded to translate into a language of their own, son to speak, depriving them at once of their grandeur and their sadness, covering them with verdure, and making them play in the landscape the part of decoration simply. While the two friends were thus amusing themselves in Rome, sketching everything they could find that was picturesque, and making even the commonplace picturesque by their way of treating it, there arrived in the city the Abbe de Saint-Non, one of the curiosity-hunters of the time, a disciple of the antiquarian school which had Winckelmann for its chief, and who was delighted to find on the spot two such zealous workers in a field bordering on his own. He at once attached them to his person, and engaged their assistance on a great work he had in hand on the antiquities of Italy. He brought the two young men to his lodgings, and made them his guests and companions, hospitably entertaining them for some months at Tivoli, at the Villa d'Este, which had been loaned to him by the ambassador of Modena. They accompanied him in making the rounds of the environs of Rome, and went with him to the South of Italy, where Hubert Robert drew the landscapes, and Fragonard copied the objects in the various museums of Naples, for the illustration of the Abbe's book. In the thick of all this industry, Fragonard began to apply himself to etching - it is likely enough that the Abbe encouraged him in the work, from feeling the necessity of finding some process for multiplying copies of the artists' drawings. 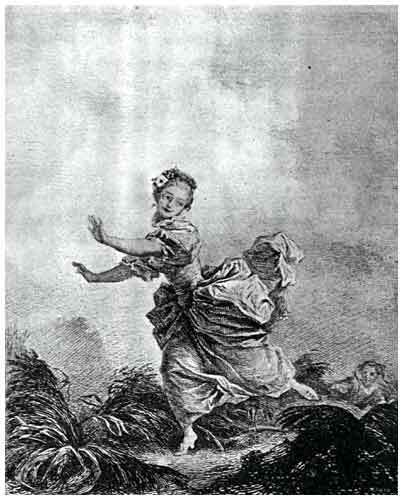 The reproductive arts of wood-engraving and copper-plate were in a bad state at this time, but at Rome there was a little nursery of engravers, composed of artists, Italian and French, but hospitable to all comers of talent, and spurred by their activity, Fragonard threw himself into the work, and at once showed a peculiar talent for the art. He copied the pictures of the Venetians - Tintoretto and Tiepolo, with Lanfranc, the Ricci, and the Carracci; but Tiepolo was his favorite, and he engraved him again and again, always on small plates, in a light and airy style, resembling, says De Goncourt, "sketches fixing a memory or a passing impression on the page of a note-book." While in Italy Fragonard made a considerable number of etchings, but after his return to France in 1765, he no longer found time for it. He had neither the leisure nor the patience needed for the art. De Goncourt says that only one large plate was made by him in 1778 - "The Wardrobe" ("L'Armoire") - one of those subjects, too free in their suggestion for our more prudish time, but which were accepted without question even when they were not delighted in, by the society that produced a Boucher, a Fragonard and a Greuze, with the Pompadour for a patron of Fine Arts and a Denis Diderot for their critic. Fragonard had sent home from Italy, as his Grand Prize picture, "The Savior washing the Feet of his Disciples," now in the church of his native Grasse, in Provence, and while in Rome he had also found time to compose several small works of a very different kind, more in harmony with his real talent and his taste. He would seem to have excited but little interest in Paris for some time after his return; but upon his presentation to the Academy on his reception by that body of his great picture - "The High-priest Coresus sacrificing himself to save Callirhoe" - he was greeted with enthusiasm by the public, and his picture was ordered by the King to be reproduced in tapestry at the Gobelin manufactory. This picture, with its crowd of life-size figures, and its theatrical pomps and splendors, is now at the Louvre, and standing almost alone as a representative of Fragonard's talent does him scant justice, for he had neither the fancy to conceive, nor the hand to execute such a scene, even though it be nothing more than a stage-tableau. Diderot, in his "Essais sur la Peinture," has a long criticism upon this picture, put into the singular form of a dialogue between himself and Grimm, in which he skillfully balances the pros and cons, but leaving the reader with the impression that the demerits of the picture outweighed its merits. The public, however, had carried away from the Salon a conviction that a great painter had arrived, and they looked forward with eagerness to his contribution to the next Salon. Great was the disappointment then, when in 1767 - for the Salons were held every two years in the beginning, and not yearly as now - all that Fragonard sent was an oval canvas representing groups of cherubs in the sky. Of this picture Diderot said that it was "a handsome omelet, well beaten, of a good yellow, and nicely browned." But, although this was an indifferent piece of painting, it marked an important stage in Fragonard's career. He had found for himself the limitations of his talent, and he never returned - except for a short period at the end of his life - to the historical and religious subjects with which he had begun. Madame de Pompadour had suggested to Carl Vanloo, and to the other artists whom she had gathered about her in friendly circle, that they should, once for all, abandon the Alexanders, Scipios, and Caesars, whose deeds and adventures had up to that time been the chief stock-in-trade of the studios, and that they should choose subjects permitting the employment of the costumes of Western Europe in the 18th century, with which they were all familiar. A chorus of objections was raised; but the princess herself dissolved them by giving Vanloo the subject he so charmingly treated in his "Conversation Espagnole." The experiment was more than successful; the picture had an immense vogue. It was engraved by Beauvarlet, and the plate was used by Beaumarchais as the model of a tableau in his "Marriage de Figaro," as he expressly states in the stage directions to the first edition of the play. The fashion set by Madame de Pompadour and Vanloo, was more firmly seated by the aid of Fragonard, who accepted it with glad alacrity, and even bettered his instructions in a number of small pictures painted at this time. These interiors - salons, boudoirs, bed-rooms - where the gay people of his day are engaged in killing time in ways a la mode, are, for us, a perfect mirror of the time. The rooms themselves, with their furniture and decorations, their ornaments and bric-a-brac, and all the multiplied apparatus of luxury and folly, are no less truly copied, down to the minutest detail, than are the costumes of the butterflies, male and female, who pursue their flippant loves in this rich parterre of curtained beds and cushioned sofas in gay indifference to the moral laws of the world outside their enchanted garden. An age like ours, buckrammed in prudery and loudly vaunting its own decency, would stand aghast at the pictures of Fragonard, and would run away and hide itself were one to attempt their description. Today, the engravings after these pictures are never allowed to see the light, except in the company of the discreet - yet we should greatly misjudge if we were to imagine that the people who welcomed their appearance, who eagerly bought them, or crowded about the windows of the shops on the fashionable streets where they were exposed, saw in them what we see, or judged them as we judge them. Looked at, if once we could so look at them - with unprejudiced eyes, these pictures of Fragonard, and not his alone, since his were only the fine flower of their breed, will appear what they are, the childish amusement of a childish people, as free from all sense of shame or responsibility as if they had been so many sparrows sporting in a wall of ivy on St. Valentine's Day. And who shall say that in all this that we call libertinage, so frankly displayed, and so openly enjoyed, there was not possibly as much innocence of evil intent as is secured by the statutory prudery of our own time? We may not bring an indictment against a whole people - to use Burke's phrase - and we decline to believe that between two such opposed systems of moral police as those of the eighteenth and the nineteenth centuries, the advantage is all on the side of the latter. This, of course, is not the place to discuss so great a matter, but a glance at it cannot be avoided in an examination, however slight, of the art of the Rococo period. "The Make-believe Flight" - the slight specimen we give of Fragonard's art, may serve to show the lightness of his touch, his airy charm, not to be hid by the stiffness and formality of a dress that would seem to have been devised by an enemy of all the graces and for a world the precise opposite of the one that delighted in it. With her hair lightly powdered, and set with artificial flowers, her young neck circled with a ruff, her slender waist imprisoned in its bodice, her skirts flying free, and revealing her discreeter petticoat, from under which her feet glance out, one lightly poised upon the ground the other pointed provokingly at the swain pursuing - a trifle, light as air, but significant enough to those who know the artist's work! As we write, a book devoted to his memory appears, "Honore Fragonard - His Life and His Work," by Baron Roger Portalis. It contains more than two hundred engravings from the paintings and drawings of the master. Fragonard led an easy pleasure-loving life in Paris, with a crowd of friends about him, artists no less than denizens of the fashionable world. In 1769, when he was thirty-seven years old, he married a Mlle. Gerard, a young girl born in his own town of Grasse, who had been sent to Paris by her family to learn some trade by which she might gain a livelihood. Mlle. Gerard's tastes led her in another direction. She took up the study of painting, and found occupation in painting fans, and in other of the lighter sorts of decoration. Looking about for some one who could give her the further instruction she needed, she naturally applied to her townsman Fragonard, and with his easy good nature, and liking for female society, he encouraged her to come to him for lessons. The rest followed as a matter of course. Fragonard married his pupil, and entered upon a new phase of his exceptionally happy life. The son of Fragonard had been a pupil of Louis David, and when the Revolution came, the master owed protection and immunity to his illustrious pupil. David exerted himself to have Fragonard made keeper of the new Musee du Louvre, placing his name at the head of the candidates. He wrote a most affectionate letter to the artist's son Evariste, in acknowledgment of a painting by him, sent for his approbation, and expressed the warmest feelings for his father and mother and Mlle. Gerard. We read the name of Mme. Fragonard in the list of the wives of artists who came to offer to their country their bracelets, their earrings, their rings, their trinkets of all sorts, and a miniature in the possession of a descendant shows her in the costume worn by these patriotic women on that occasion. Fragonard himself, sacrificing still further to the new gods of the new time, for whom he could of a certainty feel no love, turned his hand in his old age to themes in fashion, and with what must have seemed to him, remembering the days of his "Callirhoe" and his "Washing of the Feet," like second childishness, he essayed the "grand style" of David, and a return to the classic fold; but the few pictures painted by him in these last days are best forgotten. Before the Revolution Fragonard had enjoyed in common with David and other artists a studio in the Louvre, and his invested earnings brought him an income of 40,000 francs a year. With this and his current earnings by his profession he was able to live, not merely comfortably but in luxury. "His existence," says De Goncourt, to whose charming essay at biography we are so much indebted, "was bounded by the four walls of his studio, and contented itself there; a studio where the money so easily gained was spent as easily, where the table was always spread, where the appetizing fragrance of the pot-au-feu tempted even the gourmand Lantara, the landscape-painter; a studio which was in truth rather an artistic salon, decorated with pictures from the hand of the master; the walls covered with tapestries; furniture by Boule, curios from all lands - the pride of the collection a silver vase from the hands of Cellini, which afterward came into the possission of a Rothschild; a museum, in fine, where all the tastes of Fragonard were gratified, and where, amid surroundings almost princely in their luxury, the life that was led was, notwithstanding, that of simple citizens." In the financial disasters of the Revolution, Fragonard's fortune suffered; his income was reduced from 18,000 francs to 6,000. De Goncourt tells us that when the news of this disaster came, Fragonard began to caper about the room. "Are you mad?" cried his wife. "No! but I am very happy." "Why, what can you mean; could anything worse have happened to us?" "Oh, yes! They might have taken everything!" It was in this spirit of cheerful epicureanism that Fragonard had gone through life. Only once did he succumb to misfortune, and that was when he lost his daughter Rosalie, a child on whom he had built the largest hopes. His health gave way under the blow, and he left Paris, to pass a year in his native place. His death was sudden. Returning one day from a walk to the Champ-de-Mars, heated and thirsty, he entered a café and took an ice; hardly had he eaten it than he was struck by an apoplexy which carried him off; this was in 1806, at the age of seventy-four.